On Saturday, September 4th, NASCAR’s Whelen All American Series came back to life under a beautiful blue sky and not-so-cool temperatures in a warm Salute to Our Armed Forces. The docket for the event featured Western Late Models in Twin 40s, Grand American Modifieds, Street Stocks, Bombers and the Mini Cups. Nearly 2400 magnificent 99 Speedway fans poured into the venerable racing coliseum with high expectations of what the evening would hold. 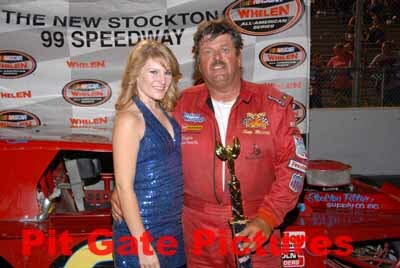 The great thing about Stockton is the fans in the stands are as revered by the drivers as are the drivers by the fans. So it goes without saying, everyone left completely satisfied on this most respectful of nights, especially since we were honored with the voice of Wild Wayne Pierce sitting high atop the Speedway in the announcer’s box once again, calling the races as only Wayne can do. Welcome home Wayne. What better way to send out the Season than with September’s Spectacular Tribute Month. A Tribute to Our Armed Forces was a genuine appreciation of our young men and women who are scattered throughout the world serving to protect our Liberties. Without these young heroes, the possibilities of Freedom would be unimaginable at best. These simple words might never reach the light of day. Thank God for our Armed Forces since the alternative is incomprehensible. 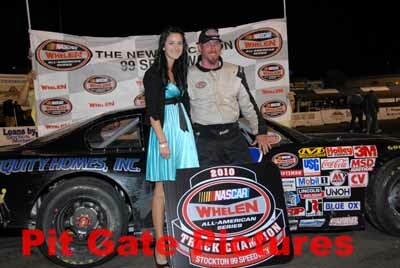 We, at Stockton 99 Speedway, would like to thank our own Hero Racer. His name is Sgt. Zack Huffman. After serving two tours of duty in the Middle East, Zach settled in French Camp. 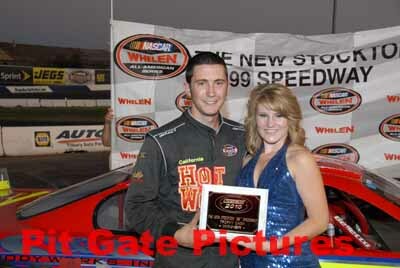 He currently races the #55 Western Late Model and sits third in Season Points. Zack is a fine young man and a great example of what the US stands for. Thank you, Zack, for serving our Country and enabling us all to do what we love doing. The Western Late Model’s Twin number one went off with much anticipation filling the air as to the outcome with the Chase for the Championship quickly approaching the checkered flag. Points Leader Chad Holman (9) of Manteca proved too tough to tussle with on this night as he turned back all challengers before crossing the stripe to the glory of victory. This one got underway with Holman on point and third generation driver, and defending Track Champ, Justin Philpott (05) of Tracy already nibbling on his right-side paint as the green flag went flying. Philpott got a fantastic jump up top and grabbed the early lead where he held strong despite Holman gnawing and clawing at his back bumper until lap 21 when Modesto’s second generation driver Jeff Belletto (12x) and Mark Holeman (21) of Los Altos made contact coming off four which sent Holeman careening down the front-stretch followed closely by the one and only yellow of the race. For Belletto’s part in the infraction, he was awarded the tail-end of the longest line. On the lap 21 restart, Holman returned the favor that Philpott had bestowed upon him earlier by getting a great jump on the outside as he soared off into the lead. 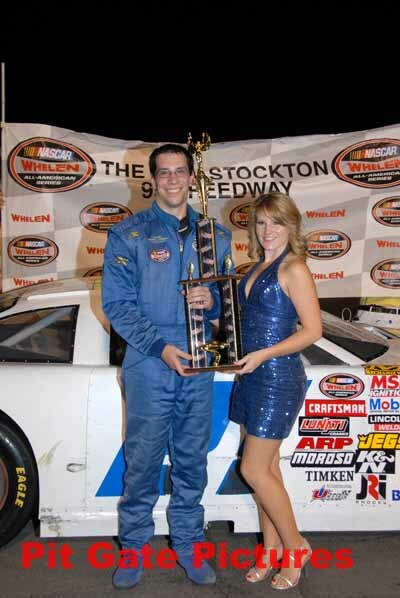 Once out front, Holman definitely had his eyes in the mirror, which was full of Philpott, but never gave in to the constant pressure applied to his bumper as he crossed the stripe to the land of glory in winning his second career Late Model event, and, by virtue of his finish, extended his Season Point’s Lead over the young Michael Sandoval (17) of Ripon, to 61. “He (Philpott) got a great jump at the start of the race because that outside line works so well,” said the quiet-mannered Holman, “I was happy and relieved when he took the inside on the restart because my car always works good out there. Over the last month, we have made great strides in improving the car’s performance, and it’s finally starting to show up on the track. But at the same time, we still have a lot of work to do.” Philpott, despite shadowing Holman’s every move, including several challenges of his own, had to finally settle for what was most likely a disappointing second. Brentwood’s Doff Cooksey (75), after struggling with an ill-handling car all day, finished on the podium in third to back-up his win last time out. 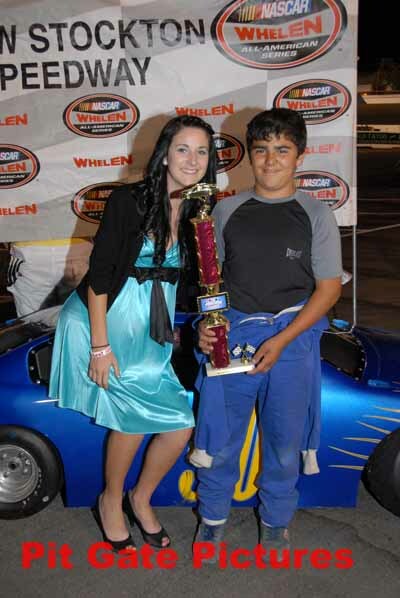 Third generation driver Nic Belletto (15) of Modesto finished an impressive fourth with Sandoval rounding out the top five. WLM Twin number two told a different story as opposed to number one. However, Mark Holeman (21) of Los Altos still crossed the finish line in victory just as winners do. And the action . . . well the action was astonishing. With an eight-invert off Twin #1, Jeff Belletto was slotted at number one and Mark Holeman was slotted alongside for the ride as Belletto grabbed the early lead going off into turn one where he looked stout until lap 12 when Brandon Trevethan (4) of Galt came spinning off turn four which attracted the attention of the flagman who sent the yellow flag flying. On the restart, Holeman got that great jump off the outside which had been available all night and he made it work beautifully as he jetted out to P1. Unfortunately, on the next go-round, someone checked-up between one and two and the accordion effect that resulted sent several cars to the pits for repairs, and with the melee, the second yellow of the night reared its ugly face. In the end, Brentwood’s Doff Cooksey (75) was deemed responsible and he took up his new position at the back of the field. On the lap 13 restart, Holeman resumed his position out front where he would remain, enthusiastically, through to the finish by a straightaway for his first victory of the year. “It feels really good to win out here. That was a lot of fun,” said the well-mannered young driver, “This will probably be the last race of my career, so it feels good to go out on top.” Belletto, after withstanding Chad Holman mimicking his every move over the last twenty-seven laps, showcased his veteran status in coming home second. Holman pulled out all the stops, but just couldn’t get around the wily veteran and had to settle for third. Doff Cooksey, after his earlier altercation, worked his way back through the field to finish fourth. Michael Sandoval, in another solid showing, finished fifth once again on the night. With his finish, Sandoval left the evening 65 points in arrears to Holman with two races left. After a three week hiatus, the Grand American Modifieds hit the asphalt surface with a fervor as of yet unseen by these drivers this year. Tony Noceti (6) of French Camp rose above the passionate enthusiasm expressed by his rivals into a realm of his own as he crossed beneath the checkers in victory. This one got up to speed with Stockton drivers Larry Tankersley (96) and David Strickland (3) on row one pacing the field to greet the green. Strickland moved out early to the lead until lap 3 when, by no choice of his own, he had to relinquish the number one slot to Tony Noceti. From that point forward, despite the incessant agitation at his back door by Modified Great Wes Miller (57) of Turlock, Noceti would not relent as he drove off to the checkers in persuasive fashion. Miller, after giving it all he had, and then some, would have to settle for an extremely close second. Rookie Ryan Stepps (98) of Escalon continued his impressive first year run with another solid finish on the podium in third. Strickland fell off a bit after a little trouble early on to finish fourth with Tankersley making up the top five. Recipients of nearly a month off, the Street Stocks returned to the high-banks to settle some unfinished business. Tonight, Points Leader Sammy Solari (79) of Escalon profited the most by having a stellar ride all the way through to the checkers. After an invert of eight, Arron Shankel (47) of Lodi was awarded pole by sheer luck-of-the-draw. That certainly wouldn’t dissuade his ambition as the green went waving above his head with Modesto’s Garland Tyler (73) at his side. Tyler grabbed the holeshot into one where he would remain but a short while when, on lap 4, Aaron Coonfield (25) of Riverbank, using a slower car as a pick, made a beautiful move between three and four to capture that prime real estate out front where he began to yard the field over the next twenty-three laps. Unfortunately for Coonfield, at the same time he took over out front, Points Leader Sammy Solari moved into second and began to chip away at the large margin Coonfield had created until lap 27 when both drivers became involved in a fierce battle over that number one slot, which, in the end, Solari would reach down deep into his full bag of experience and ride this one out to the checkers for his ninth win of the year. 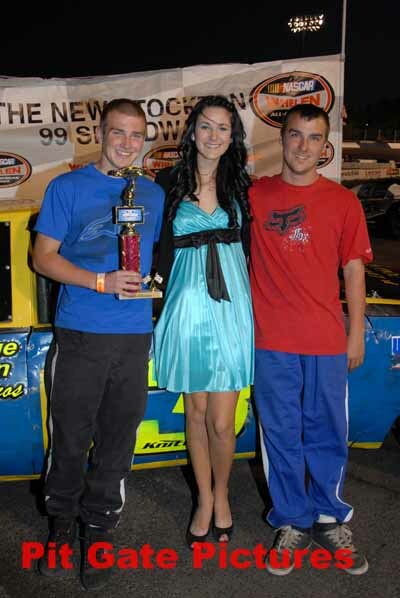 “The point is we’re here to win,” said the always confident Solari, “What about this new Panella motor?” With his win, and the fact that Ben Lewis II came back to finish second, Solari left the evening with a 29 point lead. Tyler held strong all night and finished on the podium in a solid third. Coonfield slipped back a bit over the final laps, but still managed a top five, finishing fourth, while “Racin” Jason Aguirre (45) of Atwater, after fighting mechanical issues most of the day, brought her home in fifth. The Bombers, as always, boast many-a-fan, and this evening they were all on their collective feet as Lodi’s Robbie Knittel (003) blew by the flagstand for the unbelievably stunning win. The competition in this one got up and running with Stockton drivers Mike Massone (007) sitting P1 and Jeremy Tucker (051) at P2. Massone jumped out at the green to lead the first lap but succumbed almost immediately coming off turn two down the back-stretch on lap 2 when another Stockton driver, Andrew Rumsey (043), grabbed a huge hunk of forward bite, which vaulted him, consequently, into the top spot bringing Tucker along for the ride. On the ensuing circuit, Livermore’s David Grimes (810) went sliding down the back-chute, flying head-on into the inside turn three tire barriers bringing with him the first caution period of the night. Grimes had to be extricated from his vehicle and transported to a nearby hospital complaining of severe neck pain where he was checked out and later released. After a lengthy red, the race got back underway, but due to time constraints, had to be cut to twenty laps. Over the next several laps, no less than three additional yellows were thrown as these drivers were having a tough time on restarts. On the final restart on lap 8, Knittel appeared on the front row from all the preceding attrition, and once out front, the same story that has been well written over the Season and yet again, Knittel checked out on the field and was never challenged as he drove beneath the checkers with a half-lap lead over second in what was his fifth win on the year. Speaking of second, Points Leader Travis Tucker (350) of Stockton filled that spot quite well, and with Tom Dahl’s misfortune on this night, Tucker would cross the stripe with a 44 Point lead over now second-in-points, Knittel. Massone slipped back a tick, but still managed a podium finish in third. Rumsey, after leading earlier, brought her home in fourth with Jeremy Tucker completing the top five. The Mini Cups saw a repeat winner in Cody Johnston (50) of Stockton in what was a fabulous show of talent. The win was Johnston’s second on the year and with it he reclaimed the Season Points Lead over Travis Affonso by 28. Please come out and join us next Saturday, September 11th, as Tribute Month continues with Stockton 99 Speedway’s Tribute to 9/11 featuring Street Stocks, Bombers, Basically-4-Cylinders, NCMA Sprints Cars, USAC Ford Focus Midgets in Twin-30’s, and USAC Jr. Ford Focus Midgets.